Endometriosis is a chronic condition in which endometrial tissue is located at sites other than the uterine cavity. It can occur in the ovaries, pouch of Douglas, uterosacral ligaments, pelvic peritoneum, bladder, umbilicus and lungs. Around 2 million women in the UK are affected, with most diagnoses made between the ages 25 and 40. In this article we shall cover the pathophysiology of endometriosis, the typical clinical presentation, and the current investigations and treatments available. Note: If endometrial tissue is present in uterine muscle, the term adenomyosis is used. The exact pathophysiology of endometriosis is unclear. One proposed theory is retrograde menstruation. This is where the endometrial cells travel backwards from the uterine cavity, through the Fallopian tubes, and deposit on pelvic organs – where they can seed and grow. It has also been suggested that these cells may also be able to travel to distant sites through the lymphatic system and vasculature. As endometrial tissue is sensitive to oestrogen, the symptomatology is dependent on the individual’s menstrual cycle. As with uterine endometrial tissue, women will have bleeding from the ectopic tissue during menstruation – resulting in pain and bloating/distension at the ectopic sites. Repeated inflammation and scarring can also occur leading to adhesions. During pregnancy and menopause, symptoms will be reduced. Fig 1 – Endometriosis is a chronic condition in which endometrial tissue is located at sites other than the uterine cavity. The most common presenting symptom of endometriosis is cyclical pelvic pain, which occurs at time of menstruation. In cases where adhesions have formed, the pain may be constant. Other symptoms include dysmenorrhoea, dyspareunia, dysuria, dyschezia (difficult, painful defecating), and subfertility. Those with endometriosis at distant sites may experience focal symptoms of bleeding. For example, ectopic endometrial tissue in the lungs may produce features of haemothorax at the time of menstruation. Pelvic Inflammatory Disease: This can present with dyspareunia, pelvic pain and abnormal and/or heavy bleeding. Ectopic pregnancy: This can present with dyspareunia, pelvic pain and abnormal and/or heavy bleeding, and sometimes collapse. Fibroids: This can present with pelvic pain, long duration of menstrual bleedings, heavy menstrual bleeding, a feeling of a mass or bloating. Irritable Bowel Syndrome: abdominal pain, dyspareunia and bloating. A pelvic ultrasound scan can also help determine the severity of endometriosis and ought to be undertaken before any surgery. A skilled operator can demonstrate “kissing ovaries” – where bilateral endometrioma are adherent together. Pelvic mobility can be demonstrated, including any involvement of bowel. 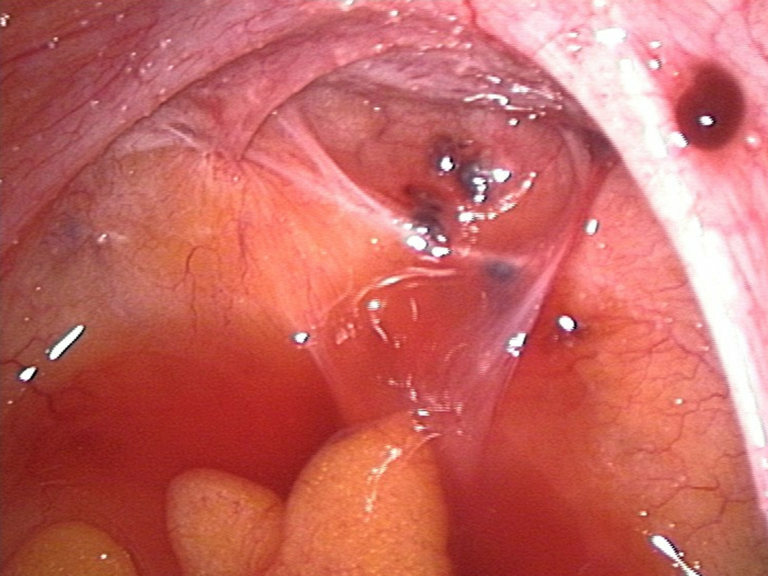 Fig 2 – Laparoscopic image, demonstrating endometriotic lesions in the Pouch of Douglas and on the right sacrouterine ligament. The treatment is based on the individual requirements of each patient. If the patient is asymptomatic, no treatment is needed. Pain can be managed through analgesia or NSAIDs. Follow the ‘analgesic ladder’ as appropriate. Suppressing ovulation for 6-12 months can cause atrophy of the endometriosis lesions and therefore a reduction in symptoms. A low dose combined oral contraceptive pill or norethisterone can be used. Injected hormones or intrauterine devices such as the Mirena coil can also be used. The Mirena has the benefit of containing a low dose of hormone. The surgical option is used if the endometriosis symptoms seriously affect the patient’s life. Surgery such as excision, fulgaration and laser ablation aim to completely remove the ectopic endometrial tissue in the peritoneum, uterine muscle and pouch of Douglas to reduce pain. Relapses will almost certainly occur and surgery may have to be repeated. Ultimate management may be a hysterectomy and removal of the ovaries with subsequent replacement of hormones until the age of the menopause. Endometriosis is a chronic condition where endometrial tissue is present at other sites other than the uterine cavity such as ovaries, pouch of Douglas, uterosacral ligaments, pelvic peritoneum, bladder umbilicus and lungs. 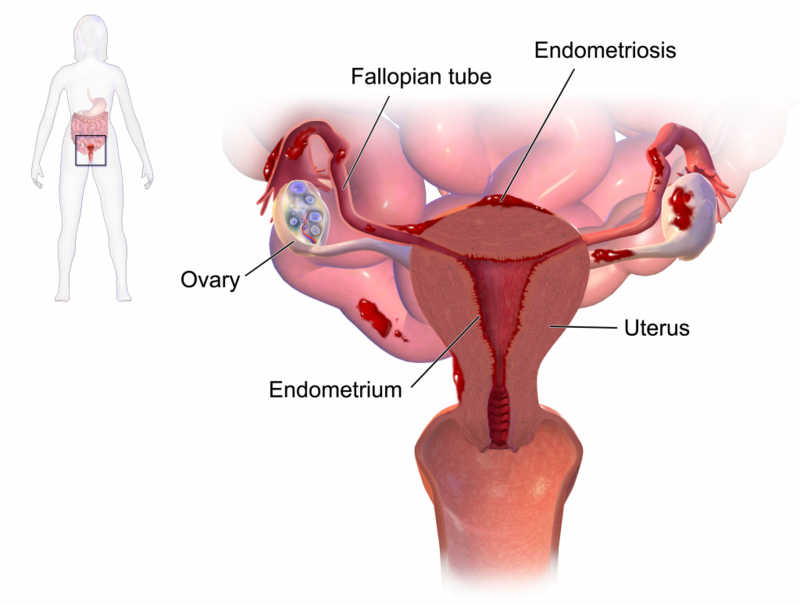 The pathophysiology of endometriosis is thought to be due to retrograde menstruation. Risk factors associated with endometriosis are early menarche, family history of endometriosis, short menstrual cycles, long duration of menstrual bleeding, heavy menstrual bleeding and defects in the uterus or fallopian tubes. Patients may be asymptomatic. Signs and symptoms also include pelvic pain, dysmenorrhoea, dyspareunia and subfertility. Differential diagnosis to rule out are pelvic inflammatory disease, ectopic pregnancy, fibroids and Irritable Bowel Syndrome. Diagnosis is made on bimanual examination and laparoscopy. Treatment is based on individual’s needs and include pain analgesia, hormonal therapy and surgery. Which hormone is endometriotic tissue most responsive to? Which of the following is NOT a common feature of endometriosis on bimanual examination? What is the gold standard investigation for endometriosis? What is the definitive management of endometriosis?